LA KINGS WIN THE STANLEY CUP OVER THE NY RANGERS IN DOUBLE OT!!! Wow what a game! I almost watched the entire game but I had to go to the Post Office before I got home. LA Hockey is brighter than ever and I see the community growing here. I live in the Valley which like most of LA in general has a large Latino population and with that being said Soccer is HUUGE out here! Recently I’ve seen kids in the neighborhood playing street hockey in parking lots around the corner. Growing up myself in Pittsburgh it’s pretty normal to see that but in LA? It just doesn’t go together Hockey n Palm Trees is the visual thought but I think it’s awesome to see a sport get embraced by a whole new demographic or city in general. Winning breeds popularity! Even in Pittsburgh before the Penguins won in 1991 it was the 3rd popular team/sport but after winning 2 in a row and being a constant threat as long as Lemieux was healthy they became the 2nd favorite to the Steelers and pretty much are til this day. Back to this win for the Kings though, I’ve never seen so many shots on goal and constant control of the puck pushing it into a double overtime! Kudo’s to the Rangers and mainly Lundquist, they really held on as long as possible but you could feel how bad the Kings wanted to win and win they did! 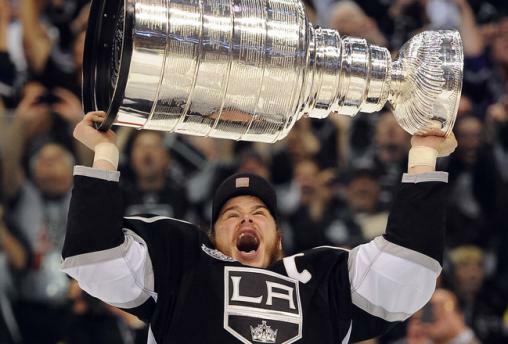 Click here for LA TIMES Coverage – LA KINGS WIN THE CUP!!! This entry was posted in Uncategorized and tagged Kings, NHL, rangers, stanley cup. Bookmark the permalink. ← LA KINGS GOING FOR SWEEP OVER THE NY RANGERS!